Baby 2 and I have birthdays only 6 days apart. We celebrated his second birthday last Friday followed by my birthday on Thursday. It has been a rough couple of weeks (including, but not at all limited to, both cars dying on the same day. And then my car dying again two days later ON my birthday) so it was kind of a relief to have special days to just celebrate and have fun. 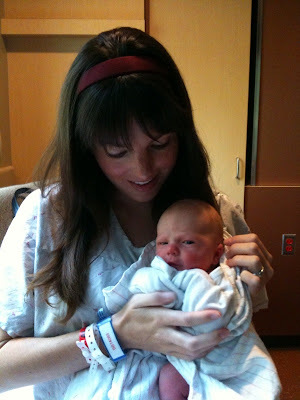 When I was pregnant I was embarrassingly dismayed to learn that my due date was April 22nd. My birthday on April 26th has always been sacred to me and the idea that I might have to share a birth week or, the horror, a birthDAY with this little interloper caused me months of worry. I was quite relieved when my water broke on April 20th. I knew there was no way I'd be in labor for 6 days so my precious day was safe. He sure cut it close though. Considering how jealously I protected my birthday, I've been surprised by my mental shift over these past two years. April is no longer my month. Instead of making up a birthday wishlist for myself, I've spent the past few weeks teaching Baby 2 to say, "I'm TWO!" When I started going through my cake recipes it was with an eye toward his birthday dinner with the grandparents rather than picking options to hold my candles. A friend texted me on Sunday asking about my birthday plans and I was a bit surprised to realize I didn't have any. Perhaps, in part, God sent me an April baby to teach me a little humility. 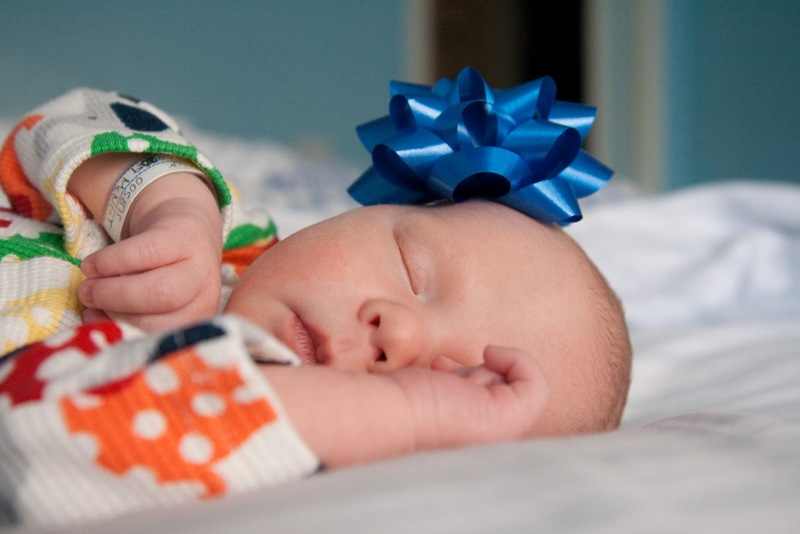 When you have a baby turning the momentous TWO your own twenty-seven seems kind of piddling. Planning Baby 2's birthday gifts (this game (which is a HUGE hit, by the way) and these books ) and activities brought me so much more joy than planning my own birthday. Because of the craziness over the past two weeks we ended up having to share a celebration on my birthday; I feel like I should have been a little sad about sharing, but I was happy to turn the evening over to him. He turned TWO! My baby is TWO! He is smart and handsome and hilarious. He has freckles and loves chocolate and always asks me to sing in the car. He eats more pancakes than I do, picks his nose like it's going out of style and snuggles with me every single morning. And he is the best birthday present I have ever been given. Someday I will buy myself a leather jacket. A real one. I will save my pennies and when I finally get it I will love it all the more for having had to work and wait for it. 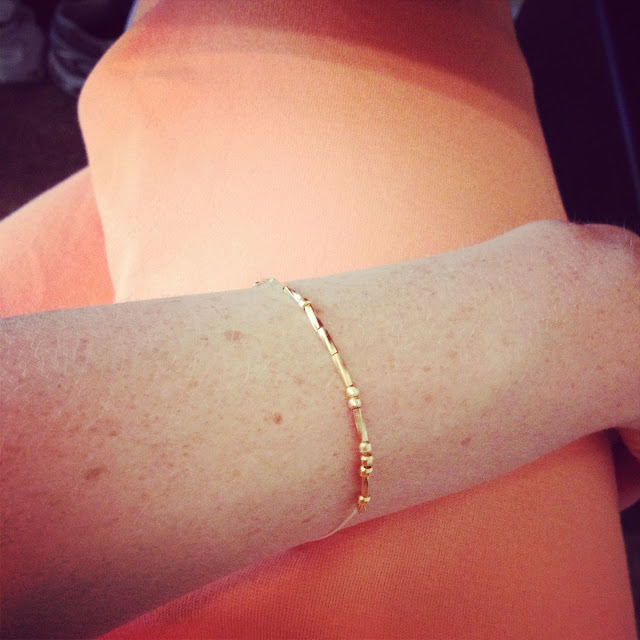 I will wear it forever and take good care of it and pass it down to my hypothetical daughter, who will also love it and care for it and wear it forever. Until that happens, there's Forever 21. Hypothetical situation: a wealthy distant relative passes away and leaves you the exact amount of money you need to buy yourself a real leather jacket. What color would you get? Black? White? Brown? Something kind of fun like the pink above? FTC Disclosure: Thanks to Accessorize who made this style challenge possible by providing the necklaces to 9x9 participants. 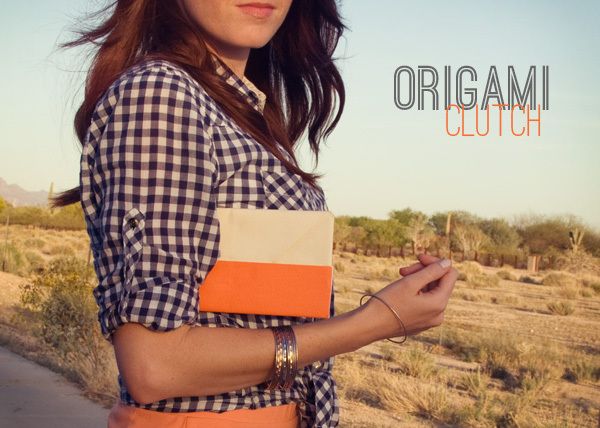 To check out their complete line of jewelry, please visit: http://us.accessorize.com/. I've been meaning to pick up a statement necklace for ages. The problem is that anytime I looked for one I was confronted with hundreds of necklaces in every shape, color, style and finish and then I'd get all overwhelmed and go take a nap. I was thrilled when DailyBuzz Style sent me this one. It's crazy versatile and just classic enough that I won't be turning my nose up at it next year (in fact, when my mom saw it she said it looked a lot like one she wore in the 80s and early 90s, which tells me it's got a bit of timeless appeal to it). It's something I wouldn't have picked out on my own but I should have. My mental dressing room attendant immediately paired it with a pencil skirt, my turquoise booties and maybe red lipstick if I was feeling brave but that didn't jibe with our scheduled weekend at a cabin up north. 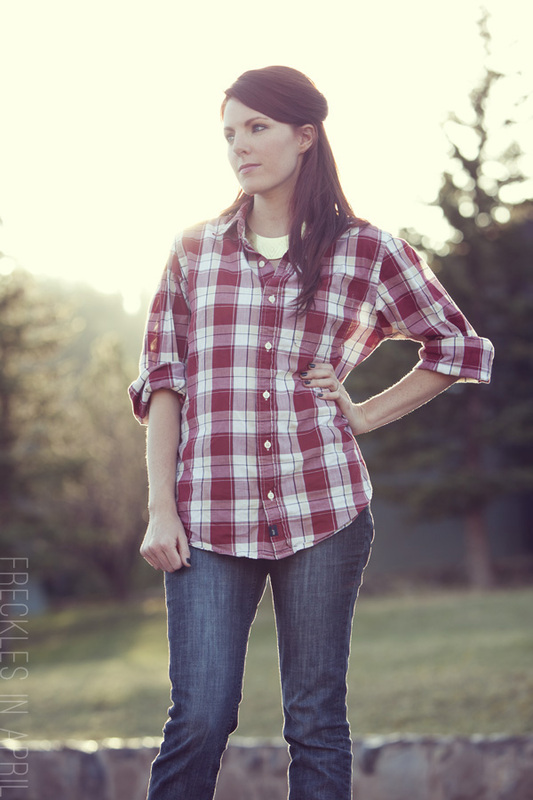 Instead, I wore it with one of Aaron's shirts and a pair of comfy, old, cuffed jeans. A whole lot of casual + a splash of fancy + riding bikes in the sunshine by the river with my fam. That's a good weekend right there. P.S. 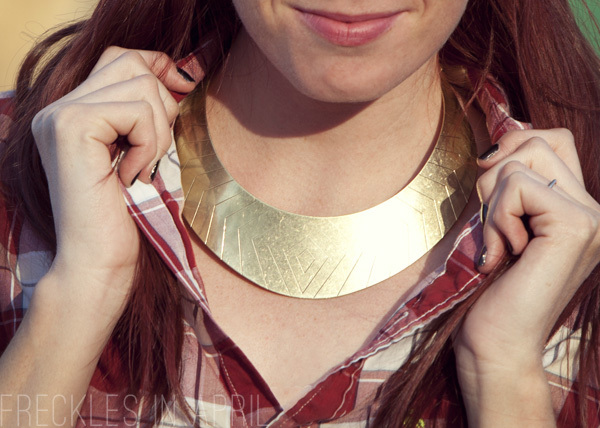 If you're in need of a good statement necklace (or, you know, other stuff), Accessorize.com is offering 20% off with the code LAUNCHUSA20 through May 5th. 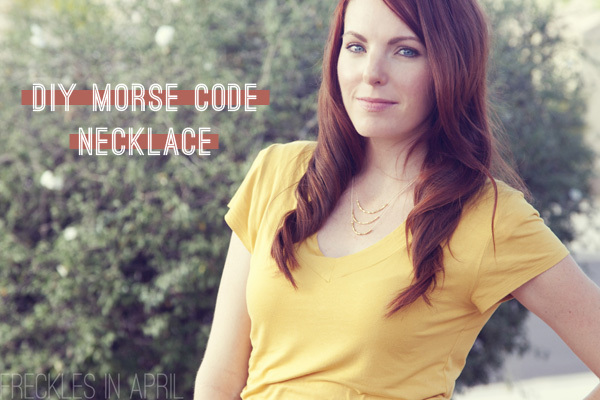 I've seen a few Morse code necklaces around and love the idea (I just googled it and apparently Anthro had some for a while). I filed it away in my brain box as a possible DIY project and then there was a day last week when I was going to lose my ever-loving mind if I didn't get out of the house so I grabbed the kids and we made a trip to Hobby Lobby. 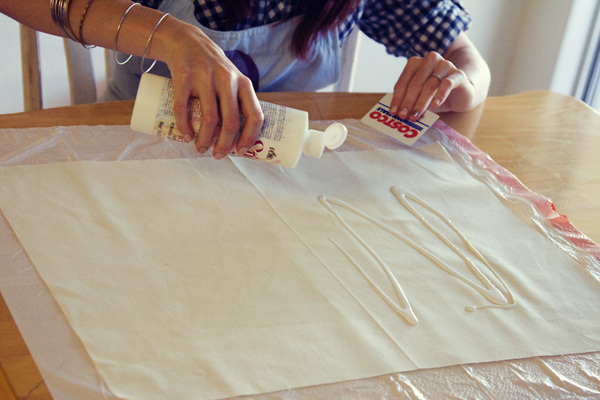 This SHOULD be a quick and easy DIY as long as you learn from my mistakes. It took me an hour to do necklaces 1.0, 2.0 and 3.0 (including a few minutes of swearing and shaking my fist at the heavens in between iterations) so I'm thinking probably only 20 minutes or so. Really. It's fast and easy. A note before I jump in: I am not a jewelry making person. Honest. I was standing in Hobby Lobby going, "I need a bead that like..smooshes. To hold stuff together. HEY! Crimping beads! That sounds good." So this tutorial probably has glaring construction issues. 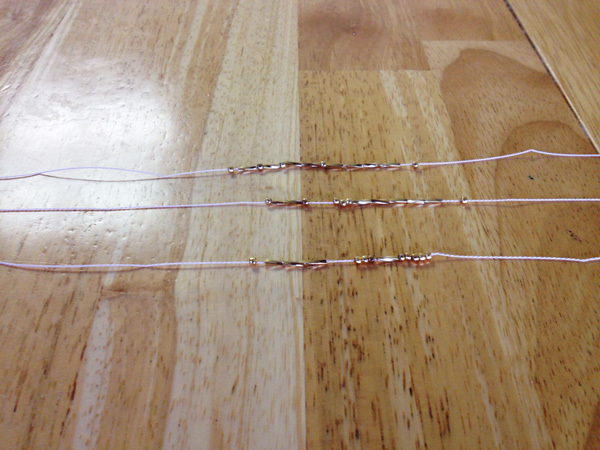 If you know jewelry making, feel free to leave a comment about how to do this correctly! For example: I feel like I should have used jump rings at some point?? Silk cord ($1.99) - I bought 2 but if I hadn't screwed up a couple times then one pack would have been sufficient. 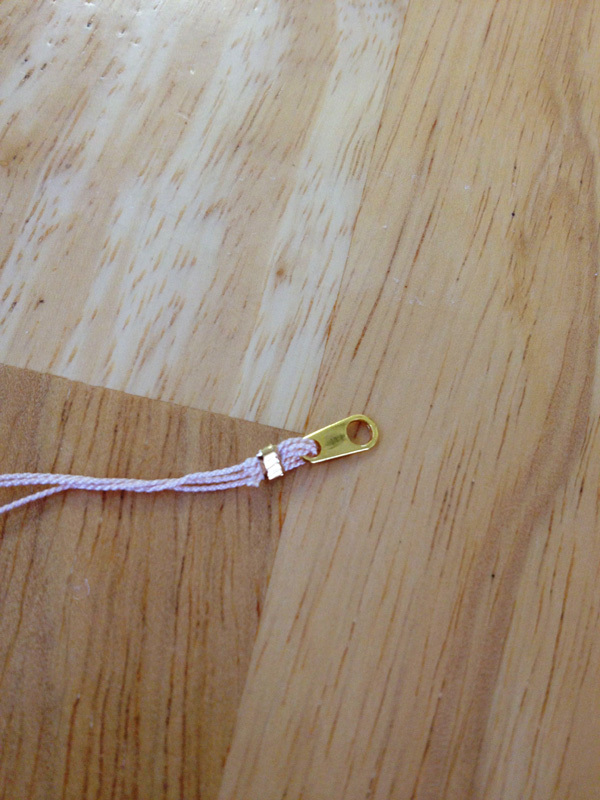 The one I got is REALLY thin, which made threading the beads easy-ish but I think next time I'll go up a bit in size. Beads ($2.99 and $1.47) - you need dots and dashes. Most of my time at Hobby Lobby was spent in careful consideration of my bead options. I ended up using gold crimp beads as my dots (since I needed them anyway) and short gold tubes as my dashes. 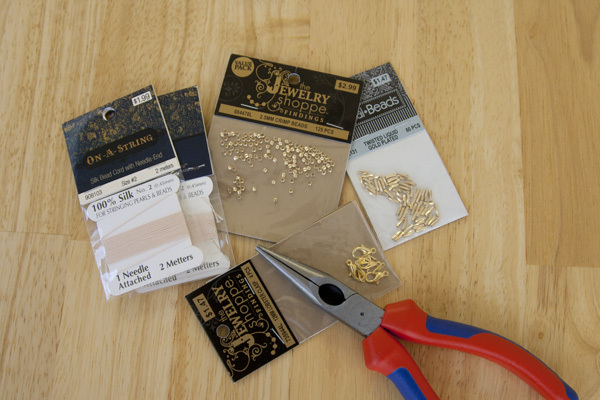 Crimp beads ($2.99) - if you don't get them as your beads, you'll still need them anyway. A clasp of some sort ($1.47) - mine are pretty big lobster clasps. In the future I'll use something a bit smaller since they seem disproportionately large next to my fine silk cord. Pliers - already had 'em in my tool kit! 1. Figure out what you want your necklace to say. Mine has Aaron's name, Stinky's name and Baby 2's name. Then hop on to Wikipedia's Morse code page and get translating! 2. 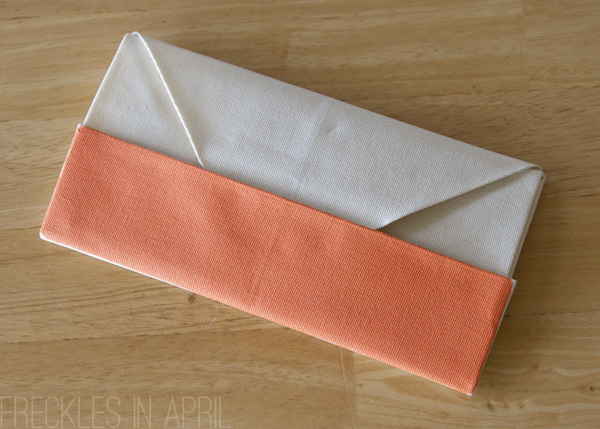 Take your silk cord off the card. It will have a bunch of kinks in it. 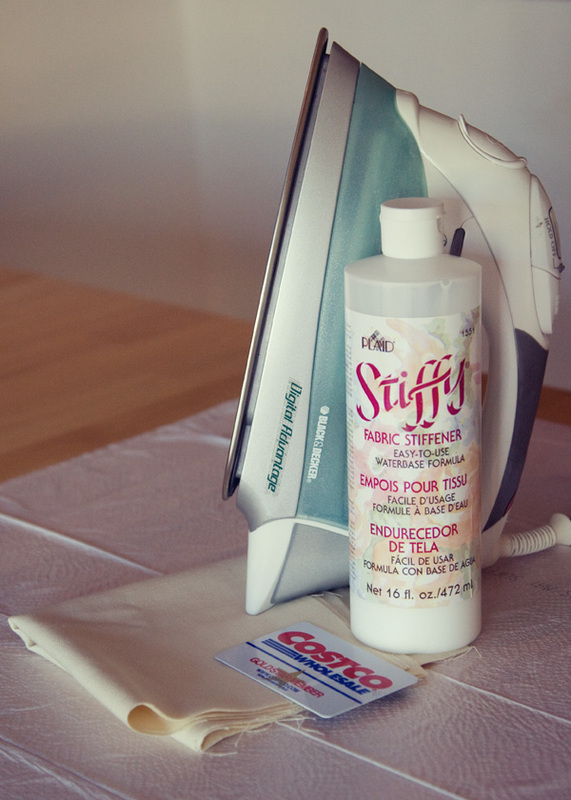 You can either iron it out or pull it through your curling iron or straightening iron. It doesn't have to be perfect. The kinks will relax out on their own eventually. 3. Figure out your lengths. This was where I made my first mistake. In Necklace 1.0 the uppermost strand was choker length. It looked awful and didn't feel great either. By the time I got to 3.0 I had figured out that I wanted strands that were 16.5", 17.5" and 18.5". 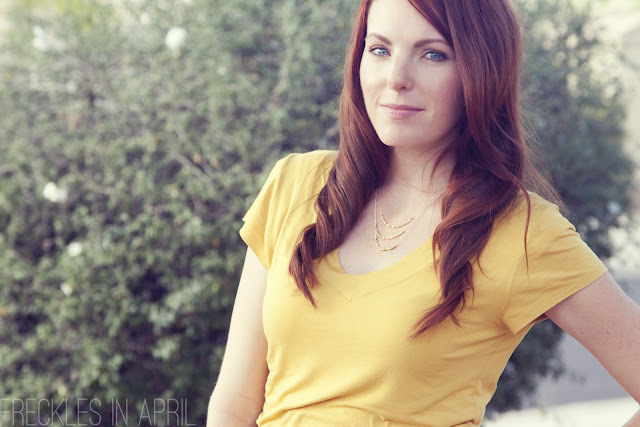 Go longer or shorter according to your preferences and how many strands you want. 4. 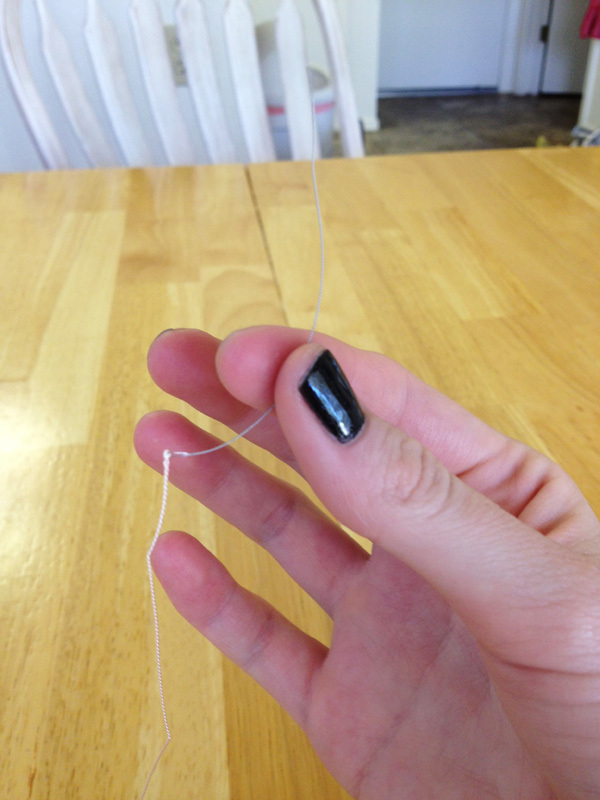 The silk cord comes with a convenient little piece of thin wire attached to the end for easy beading. I put my beads for "Aaron" on, pulled them to the end, then cut 16.5 inches off that end. Repeat with the next set of beads and cut 17.5". Repeat with the last set of beads and cut 18.5". 5. 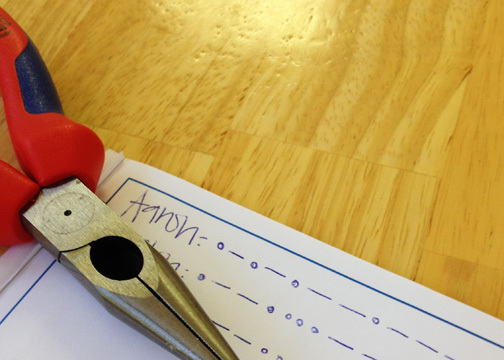 Lay out your strands how you want them (make sure all the names are going the same way!). If you'd like, tie a little knot by the outermost beads to keep everything in place (I skipped this mostly because I didn't want it messing with my lengths) then take a crimping bead and poke the threads through. This is where I make the fatal mistake with Necklace 2.0- keep the ends even and do the best you can to keep the threads in the right order. 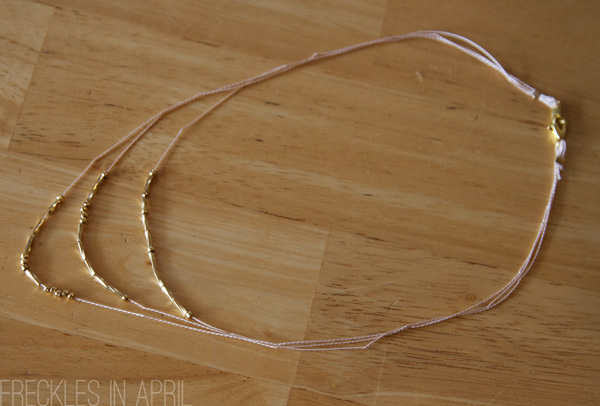 If you start rolling them around then you're going to finish your necklace and the strands are going to be all wonky and you won't be able to untangle them because they'll be crimped in place. No bueno. 6. 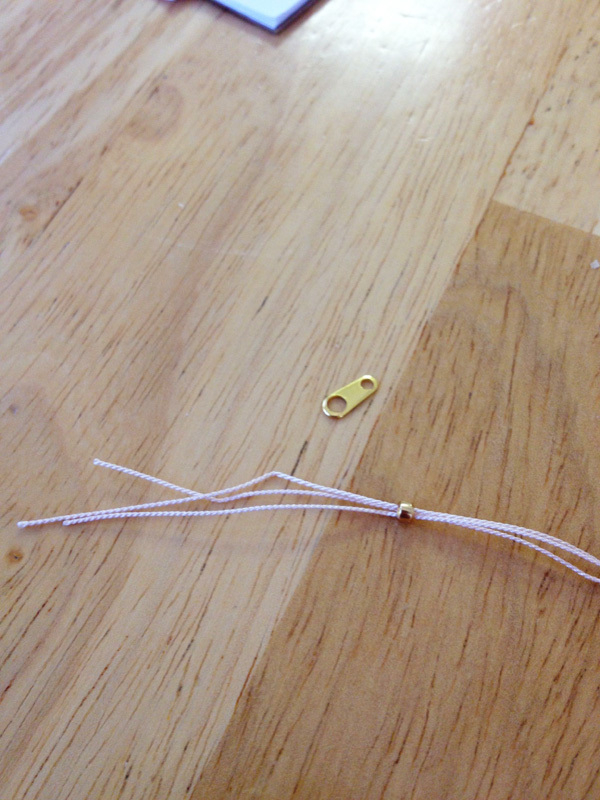 Pull the threads through one piece of your clasp then stick them back through the crimping bead. It's easier if you give yourself a looong tail and get the ends through and then scootch everything back toward the clasp. As not demonstrated in the photo below. 7. 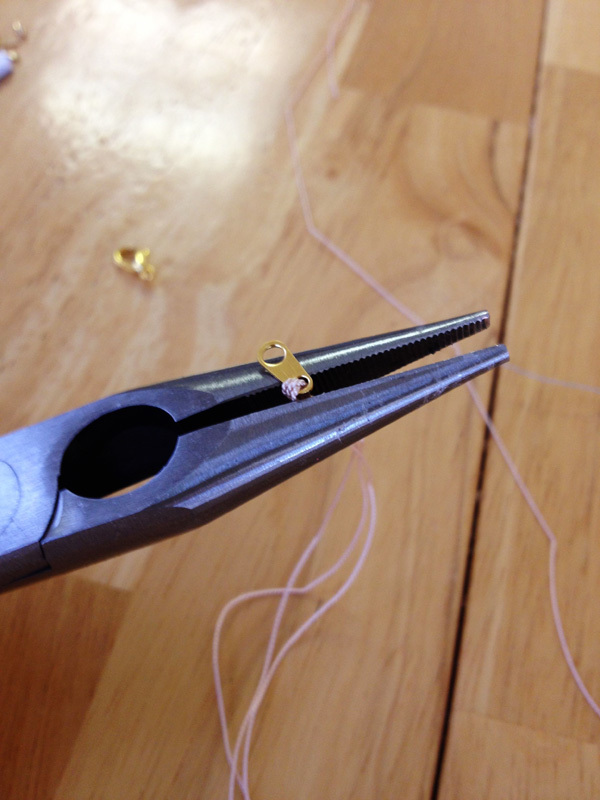 Crimp the bead and trim any ends. 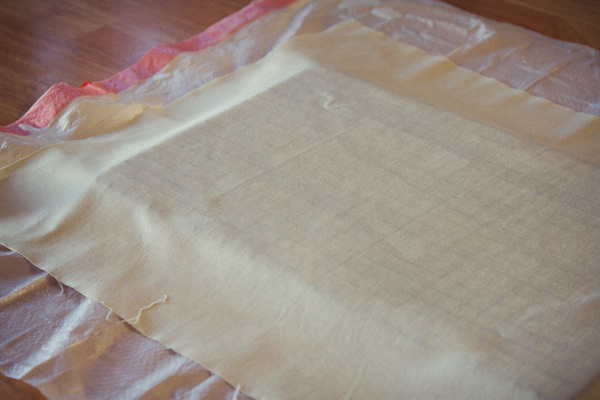 You can see how I kept the threads straight and in the right order when I put them through the bead and then crimped. 8. Repeat on the other side with the other half of the clasp. And you're done! I had a bunch of extra cut cord laying around from Necklaces 1.0 and 2.0 so I made one into a bracelet. I crimped a bead on each end to keep everything in place in the middle of the bracelet. It says "Let it go." Chicken and Gnocci Soup (Olive Garden knock-off) - This soup is one of the few things I really like at Olive Garden and I was thrilled to run across this recipe. It was so delicious that I almost had the leftovers for breakfast the next day (I managed to wait until lunch). However, the recipe calls for 1 quart of half-and-half which is kind of a crazy large amount. A pint was plenty for my purposes. Lentil Soup - I'm not actually sure I've ever had lentils before this soup. But it was delicious and hearty and wonderful. Also, we ate off of it for days. You could probably halve the recipe and be fine (unless you have ten children, in which case I would make a full batch). Strawberry Heart Oreos - these were super cute and quite delicious. I'd really like to try a from-scratch version though. Boxed stuff always tastes chemical-y to me now that we don't eat it very often. Cinnamon Brown Butter Breakfast Puffs - Oh man these were good. I made them for the joy school kids when it was my week to teach and they hoovered them. Aaron and I were happy to eat the few that were left. Slow Cooker Shredded Beef - I misread the recipe the first time and added one can of chipotle peppers in adobo sauce instead of one chipotle pepper in adobo sauce. Aaron LOVED it. I could barely eat it unless it was wrapped in a tortilla with plenty of guac, lettuce and cheese. I scaled back the peppers a bit the next time and it was so so good. I've gone back to this recipe a few times. Green Bean and Shallot Ravioli Salad - I LOVE this recipe. Aaron isn't quite as fond of it but he also doesn't love filled pasta (...weirdo) or lemon so that's his loss. Last time I made homemade ravioli with homemade ricotta and ohhh sweet mercy it was good. Wisconsin Cauliflower Soup (Zupas knock-off) - this was fine the first time around but the next day I added a bit more cheddar and a bunch of steamed, chopped broccoli to the leftover soup and it was so so good. Buttermilk drop biscuits - I've started making these almost every time we have soup. 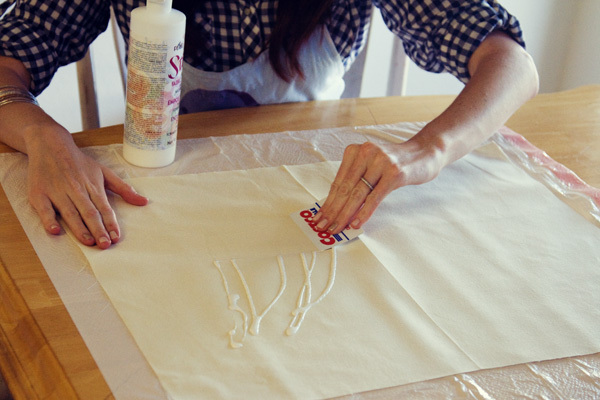 They are ridiculously good AND super easy. Creamy White Chili - I'm not a chili person and no one in our house is particularly fond of beans so it speaks volumes about this recipe to say that we love it (although, I do halve the beans). Alfredo - For some reason our go-to alfredo sauce has been..not good lately. It was reliable for years and suddenly it never turns out so I went hunting for a new one. This is the easiest recipe ever but there aren't really words for how ridiculously delicious it is. I figured with so few ingredients I should spring for higher quality parmesan and we were not disappointed. We had it twice in one week. Cream Puff Squares - Holy crap I love these. On Easter Sunday I felt so ill from all the junk I ate that I swore Monday would be all vegetables and healthy stuff. And then I woke up Monday morning and fell face first into the pan of cream puff squares in the fridge. I am weak. Normally I share outside stuff when I do Sunday Shares but this week I want to share some of my own thoughts. I apologize for the length. Introspection makes me wordy. Now, concerning the state of the soul between death and the resurrection-- Behold, it has been made known until me by an angel, that the spirits of all men, as soon as they are departed from this mortal body, yea, the spirits of all men, whether they be good or evil, are taken home to that God who gave them life. And then it shall come to pass, that the spirits of those who are righteous are received into a state of happiness, which is called paradise, a state of rest, a state of peace, where they shall rest from all their troubles and from all care, and sorrow. Reading those verses reminded me of a woman I know who passed away a couple years ago. She had been sick for some time and when the end came she was prepared. Those who were with her when she died said that her last hour was one of the most spiritual experiences they had ever had. She spoke of angels and lights in the room. She was at peace, joyful even, and when her breath slowed and stopped she had a smile on her lips. As I pondered this I wondered, if I were in her shoes this morning, would I be able to depart so peacefully? The answer, at that moment, was no. A resoundingly loud and painful no. I was super annoyed at Aaron for getting strep throat that week. Because, you know, he did it on purpose just to make my life hard. For a year and a half I have been telling anyone who would listen how much I disliked being a Primary teacher at Church (Primary is the children's organization). I had expended tons of mental and physical energy complaining to myself and everyone else about how I wanted to be anywhere but there. 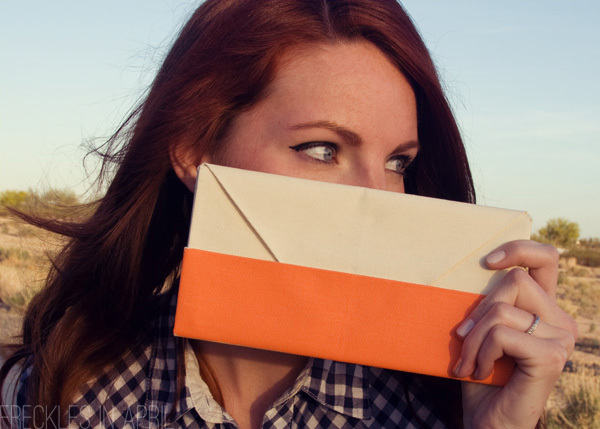 I had been stewing over an injustice done to a friend, even after she had made her own peace. Three small and simple words at a time when I desperately needed the reminder. And I did it. I let go of my exhausting, stupid annoyances and grievances. And I felt so. much. better. I immediately went to Aaron and apologized for being a jerk. I came up with some ideas for teaching my Primary class that afternoon and didn't waste mental energy on wishing I didn't have to go. * I felt such a sense of peace about my life and everything and everyone in it. It didn't last....I had to remind myself again a few hours later. Then again when I woke up the next morning and then the day after that. But all week I focused on just letting things go and this week has been amazing. I've got an inner peace going on that makes me feel so much more relaxed and happy. If you have something today that is tearing at your brain, wasting your time, draining your energy or weighing you down, let it go. Just for today. When you wake up tomorrow you'll probably have to do it all over again but that's ok..worry about it then. 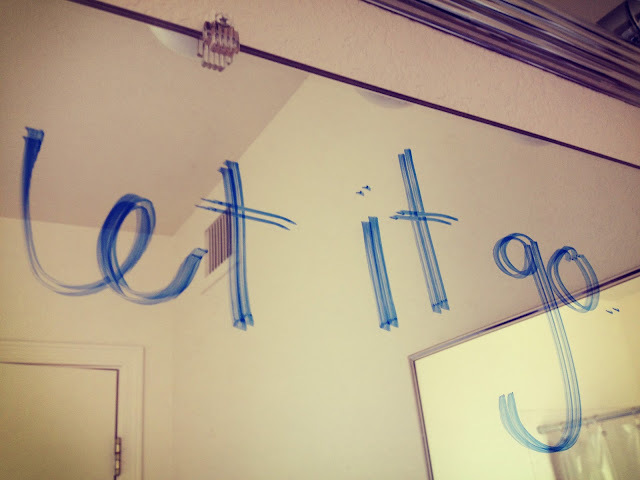 For today, for now, just let it go. *of course, as soon as I made my peace and decided to just be happy about being a Primary teacher, I was given a new assignment with the young women. I love the colors here (and, of course, the stripes). I actually wore a very similar outfit just a few days before Erica sent us the inspiration so that worked out well. I already had a good idea of what I was going to wear! 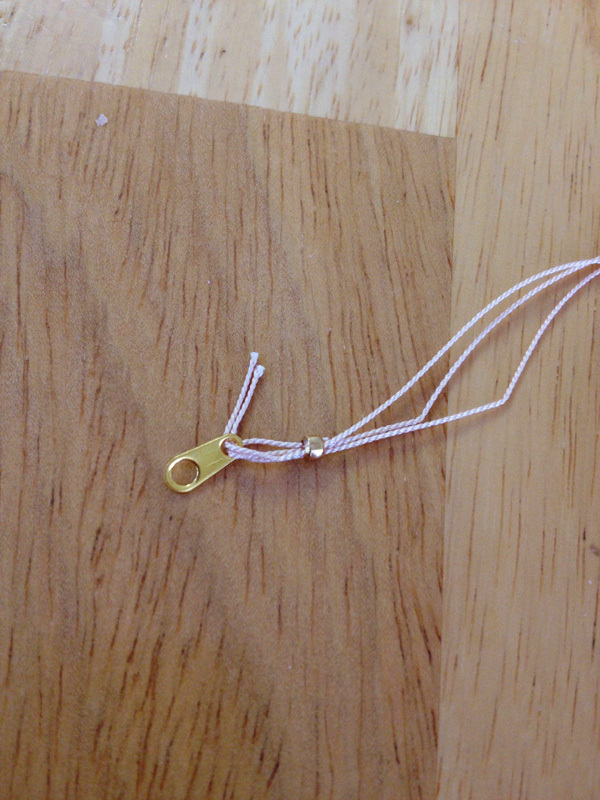 My DIY Morse code necklace. I LOVE how it turned out..tutorial coming next week! Click to enlarge if you want a better view. I never would have worn these colors alone, much less together, before I dyed my hair red. It's not even that big of a change from my brown (which has some reddish highlights naturally) but it has completely changed my color palette. I love that I'm finally branching out from blue, gray, black and white. It only took me 27 years. 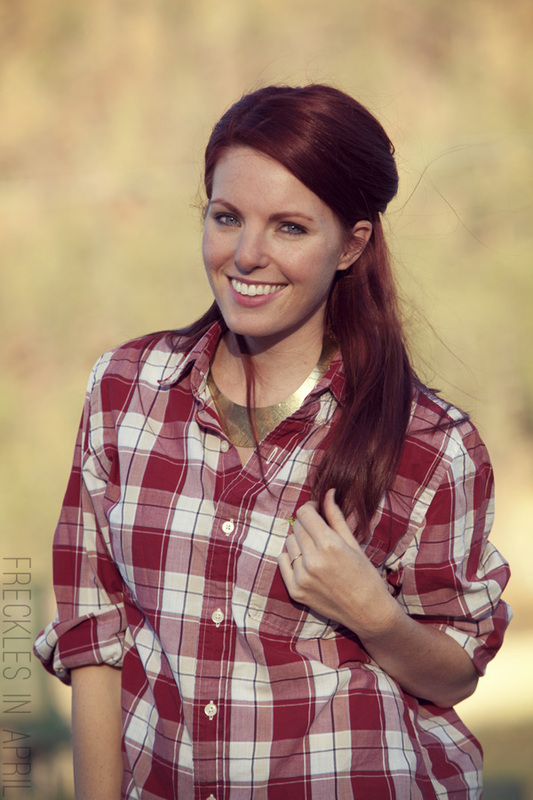 I've been talking myself into and then back out of this J.Crew top for a few days. Such a flattering silhouette! And it comes in three really pretty colors! ...Except I don't need it! Not even a little bit! So when I ran across this F21 top I said, "HEY! I know that shirt!" 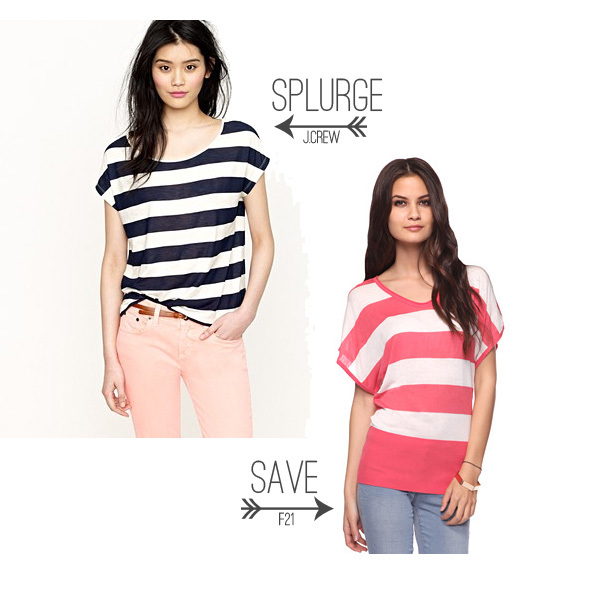 The J.Crew one is cotton and the F21 one is knit, but the stripes and silhouette are pretty similar. If I were to talk myself into a new shirt I think I'd probably splurge on the J.Crew one ($40 isn't too painful and the peach version is SO pretty) but it's always nice to know there's a cheaper option! As much as I love these pieces, they're all a bit more than I want to spend so I came up with a fun (and easy!) 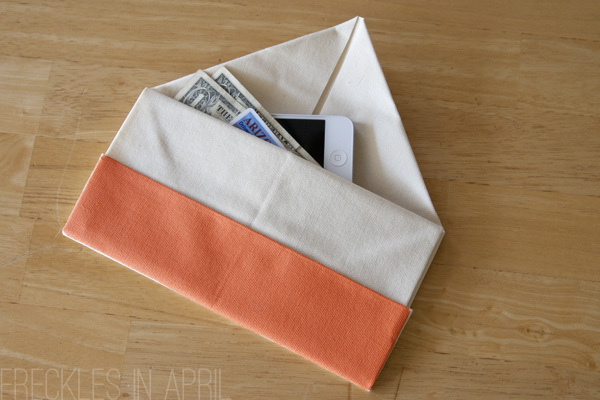 DIY that I'll be posting tomorrow!